Once again the Program Committee is hard at work building a teaching staff for each workshop. While they continue to juggle schedules, travel plans, and more, they have put together a sneak peek at a few of the 50+ teachers that we can expect this summer. We are very excited to bring to you a preview of some of the wondrous new offerings you can expect at this summer’s workshops. This is just a small representation of the forthcoming slate, so rest assured that you will see many familiar and treasured names appear when the finalized program is announced shortly. We are delighted to welcome Bob Beer back to Mendocino after an extended absence. Bob, who has been living in Turkey for many years studying various musical styles, will be offering a class in kemençe/Pontic lyra and a Turkish singing class. 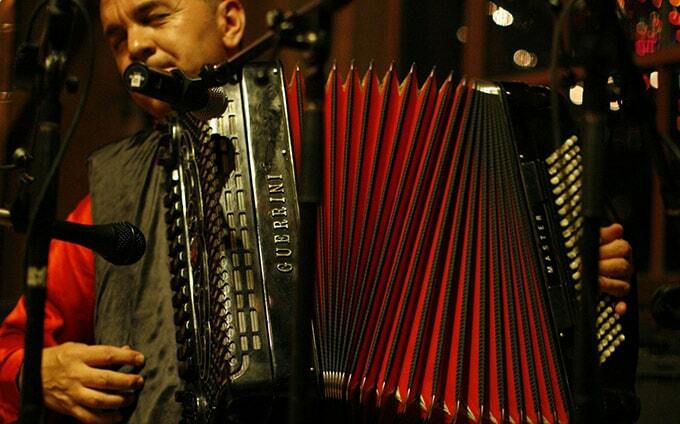 Ethnomusicologist and multi-instrumentalist Kalin Kirilov will be teaching accordion and a Bulgarian ornament/theory class at both east and west coast workshops. Milo Destanovski, a native of Berovo, Macedonia, will be back to teach zurla at both workshops, and, new this year, will be leading a Macedonian dance class at Mendocino. He will be joined at the east coast workshop by Jessica Ruiz, where they will offer multiple levels of zurla instruction and lead the Macedonian village ensemble. Miamon Miller, master of Romanian music, will teach a violin class and direct the Trans-Carpathian ensemble at Mendocino. Known for his early fieldwork in Bulgarian and Serbian folk dances, Martin Koenig will be teaching Vlach dances and more at Mendocino. For our devoted dancers on the East Coast, we welcome back Joe Graziosi (Greek) and Steve Kotansky (Albanian and other Balkan) to Iroquois Springs. Stay tuned—more dance teachers are in the works. The Rhodopes are well represented by Maria and Vassil Bebelekov as they add their Bulgarian magic to the Woodlands and the Catskills, Vassil leading gajda and bitov ensemble and Maria Bulgarian singing classes. The inimitable Merita Halili and Raif Hyseni will weave their Albanian enchantment once more at Iroquois Springs. Vlado Pupinoski, who taught to rave reviews last year at Mendocino, will be offering Macedonian clarinet and sax classes on both coasts this year. If you missed Ljubomir Živkov’s Serbian singing class at Iroquois Springs last year, this year he’ll be offering two classes of songs from the former Yugoslavia. Tapan will be finessed by Matt Moran at Iroquois Springs and Jerry Kisslinger at Mendocino. This list is just the tip of the iceberg. Please stay tuned as there will be lots more information coming soon, when we announce the full, confirmed slates as soon as workshop registration opens next month.